For those in search of a truly out-of-the-ordinary attraction, look no further than Austin’s Cathedral of Junk. A backyard art project that (some might say) got out of hand, the structure is made of wired-together items ranging from bicycles to TVs to surfboards. Kids tend to see it as the ultimate, multilevel fort. The artist and homeowner Vince Hannemann has devoted countless hours to his creation, and it’s still not complete. It’s the kind of art that gets more impressive the more time you spend with it. You may be underwhelmed when you arrive in this small backyard to see a tangle of metal, rubber, wires and miscellaneous cultural artifacts. Once you’re actually inside the structure, however, it’s a whole different story. There are parts you can walk through, and occasionally you’ll happen upon a wheel or button that seems to actually do something when you interact with it. There are colorful walls made from the bottoms of soda bottles and surprise peepholes through old tires. After a while, patterns begin to emerge. Items of a similar color or texture are grouped together. Some areas are packed with shiny CDs while others look like some sort of steampunk gadgetry. A variety of prescription pill bottles pop up throughout the site. It’s easy to see the artwork as a commentary on waste, consumer culture, overmedication or maybe retro toilet design, but the meaning is all in the eye of the beholder. Hannemann doesn’t offer much in the way of interpreting his own work, but he enjoys other people’s reactions to it. Every now and then, visitors break down in tears as they wander through the structure. Make sure you look up once you’re inside, and you’ll see that there is a cathedral-like effect in the spire-shaped partial roof. The structure is about 30 feet tall, and there are stairways, ladders and even a slide made from tile for kids. Hannemann is also considering building a larger slide for adults. 4422 Lareina Drive, Austin, TX 78745. This is a private home in a quiet residential neighborhood. Do not drop by without making an appointment. There is no parking on site. The neighborhood is situated between South Congress Avenue and South 1st Street. Pay close attention to signs, but free parking is usually available at nearby businesses and along side streets. One easy way to ensure that you won’t get towed and support a local business at the same time is to have a delicious Tex-Mex breakfast or lunch at Casa Maria on South 1st and then walk from there to the Cathedral of Junk. Just down the road on South Congress Avenue, a huge new public market is under construction. The St. Elmo Market, scheduled to open in late 2018, could bring a whole new surge of tourists to the area. It will be walking distance from the Cathedral of Junk. The development also includes high-rise residential units, which will significantly increase the neighborhood's population density. Parking will soon be available there as well as at The Yard, another new development near South Congress. It's already home to a brewery, a winery and a whiskey distillery, and the complex is just getting started. The whole far South Congress corridor is experiencing a renaissance that could be could news for the Cathedral of Junk or could lead to its demise. All of these projects claim to be focused on "makers" and creative types, but it remains to be seen if offbeat arthouses will be able to survive in this quickly gentrifying area. Tours are available by appointment only. Call (512) 299-7413 to set up an appointment. Suggested donation: $10 per group. While some have described the artist as "prickly" or "moody" at times, he's usually very friendly and laid-back as long as people call in advance. He often holds court on the throne he's built for himself within the structure, and he's happy to answer questions about his masterpiece. Even when he's in a bad mood, his two dogs are excellent greeters. The site has been rented for concerts, birthday parties, school field trips and even weddings over the years. Any relationship that’s strong enough to be formalized in a Cathedral of Junk is bound to be a lasting one. 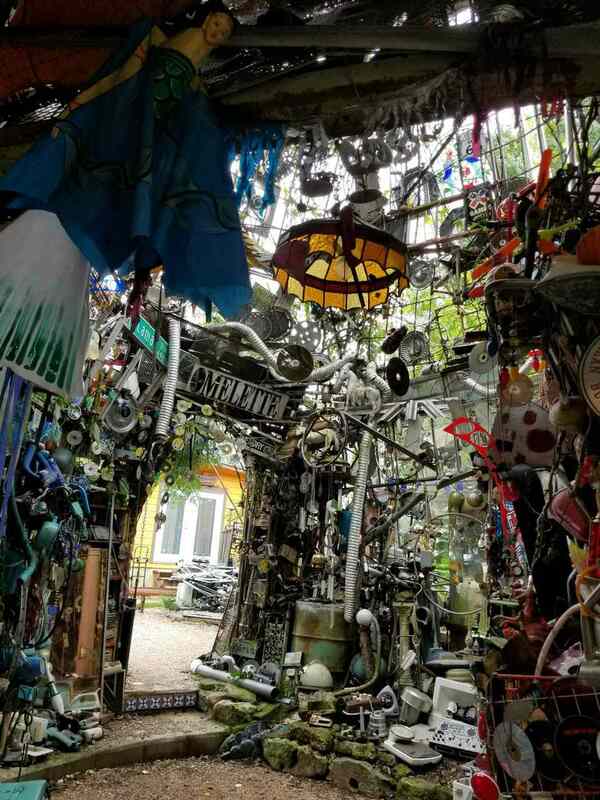 Hannemann started building the Cathedral of Junk in 1989. While he started with a few hubcaps and some of his own junk, soon friends and fans of his work started offering items to be included. This process continues today, adding a collaborative aspect to the project. He doesn’t use everything he’s given. He’ll try to find a place for it, but each item must fit into his vision, or at least his vision in that moment. In 2010, after receiving complaints from neighbors and visits from the city’s code compliance department, Hannemann came very close to tearing the whole thing down. The south Austin neighborhood around the house was in the throes of gentrification, and his new neighbors were increasingly impatient with this quirky attraction. He actually did disassemble a large part of the structure, so today’s Cathedral of Junk is really an almost completely different version than the original. One sticking point had been his pyramid of TVs, which had to come down (he’s now built a smaller TV-based sculpture that’s up to code). Yet the artist just couldn’t let his life’s work go after spending more than 20 years on the project. He consulted experts to ensure that the structure was sturdy and safe, and worked on getting all the required permits. At one point, a city inspector carried several heavy loads of water on his back into the structure to test its sturdiness, and it passed with flying colors. The cathedral has also endured many seasons of high wind and heavy rain, so it certainly seems built to last. In recent interviews, Hannemann has indicated that it might soon declare the project finished and start working on smaller sculptures instead. As of March 2018, the project is still going strong.